This shortcode allows you to display a list of (all) authors in your site anywhere you want. It can be used anywhere within WordPress where shortcodes are supported. For most users, this will primarily be within the content of a WordPress post or page or the sidebar. Each author on the list links to their author archive page and you can make them to be displayed using different layouts: as a list, as a grid, as author boxes or even as a dropdown select. That author list can be customized making use of the optional attributes this shortcode can take. 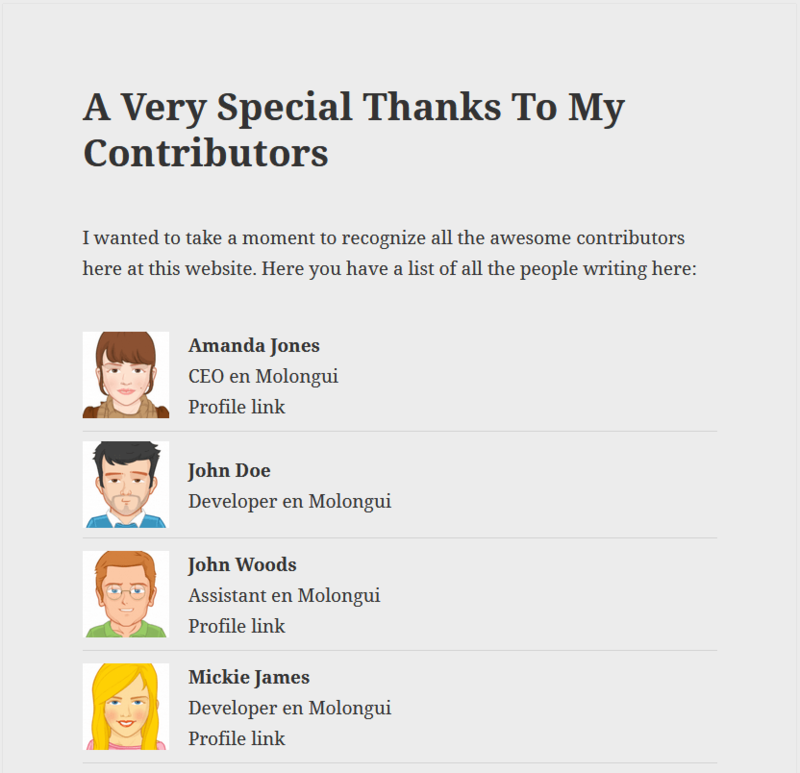 When installing Molongui Authorship Premium, a new page named “Contributors” is added. 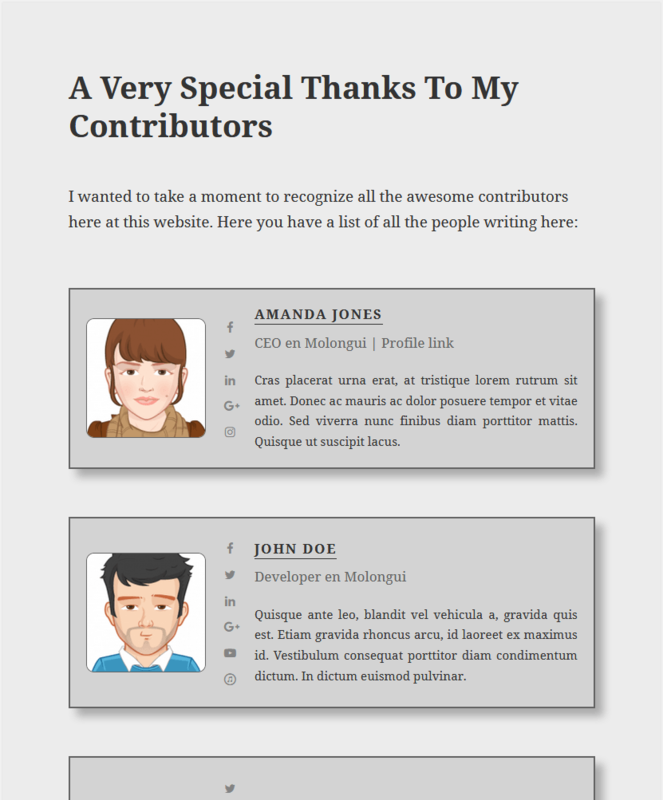 That page makes use of this shortcode to display a list of all the authors in your site who have contributed with, at least, one content. You can edit the shortcode in there to customize the list to your liking. Author list displayed as author boxes. How the authors will be displayed. Accepts "select", "list", "grid" or "box". How the authors will be arranged. Type of authors to list. Accepts "authors", "users" or "guests". Designates the ascending or descending order of the "orderby" parameter. Sort retrieved authors by parameter. Accepts "name", "first_name", "last_name", "mail", "job", "company" or "post_count. Comma separated list of registered authors to exclude from being listed. Comma separated list of guest authors to exclude from being listed. Whether to list only those authors with at least one authored post. Maximum number of authors to list. The icon to display before the author name on the flat layout template. CSS class(es) for the select. Custom attributes to add to the select tag. Layout used to display the list. Accepts "flat", "basic" or "complete". Was available from version 1.3.5 to 2.3.5. The icon to display before the author name on the flat style template.